Say Goodbye to Mold, Mildew and Moisture. Air-Dryr is an inexpensive and effective way to fight moisture problems, cold drafts, and corrosion. Designed to operate anywhere, 24 hours a day. Place Air-Dryr on the floor in any damp, enclosed space and plug into a 110/220 volt outlet. 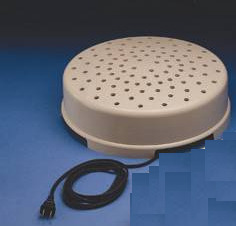 The damp air is heated to the point moisture is held in suspension (above dew point), then released through the top vents of the device. As warmed air rises, cooler damp air is drawn in, where it too is heated. Air-Dryr costs no more to operate than the burning of a light bulb. A thermal cutoff turns the unit off should air flow be impeded. 1458 Air-Dryr 1000. Handles up to 1000 cubic feet of living space. Draws only 1.1 amps,130 watts. Circular unit measures 13.5" in diameter (34 cm) and 4.25" high (11 cm). EU model handles up to 28 cubic meters of living space.